Dean WRJ, Franke U, Joseph G, GonÃ§alves FM, Mills MSL, Milton SJ, Monadjem A, Oschadleus HD 2012. Type specimens in the bird collection at Lubango, Angola. Bulletin of the British Ornithologists' Club 132: 41â€“45. "In June 2008, Dieter Oschadleus was part of a team that spent two weeks in Lubango, Angolo, cataloguing the bird collection at Instituto Superior de CiÃªncias da EducaÃ§Ã£o there. Dieter did a report of that trip at the time. There was deep concern that the bird collection may have been destroyed or damaged during the long civil war in Angola and there were worries about its safety. But they found that museum was still intact and the specimen collection completely accessible. It contains about 41 000 specimens of more than 850 species. During the two-week trip, data from 15 000 labels were entered into an electronic database; digital photographs of the remaining 25 000 labels were made, and the data were entered into the database subsequently. This information will be part of the Angolan bird atlas. 22 avian taxa have been described from specimens collected in Angola and all of the type specimens for these descriptions were housed in the bird collection of this museum. There was particular concern about the whereabouts of these type specimens and their safety. They were all found, and this paper reports the key information about them. You can get a copy of the pdf of the paper from Dieter." The only weaver listed in this paper is the Scaly-feathered Finch. The type of Sporopipes squamifrons pallidus Rosa Pinto 1967, was a male collected in Caraculo (15Â°01â€™S, 12Â°40â€™E), Angola, on 14 June 1962, by A. M. Ferreira. 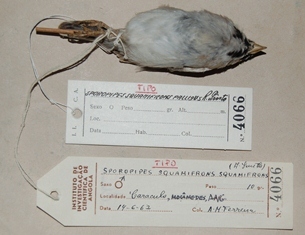 The ISCED collection has ten specimens labelled paratype and eight labelled topotype. The taxon may be synonymous with S. s. squamifrons (A. Smith, 1836).